I was diagnosed with MS in 2004 and I am currently 54 years of age. At the time I was relatively active and played the running game of basketball and jogged. Whilst it was a relatively slow progression, my mobility was gradually affected. My first mobility aid was a single stick about five years ago and then occasional use of a mobility scooter. I have some peripheral vision issues, pins and needles and slight movement issues in one arm. At a Naidex show in London I came across the Parasport stand and had a chat about possible sports I could take part in. 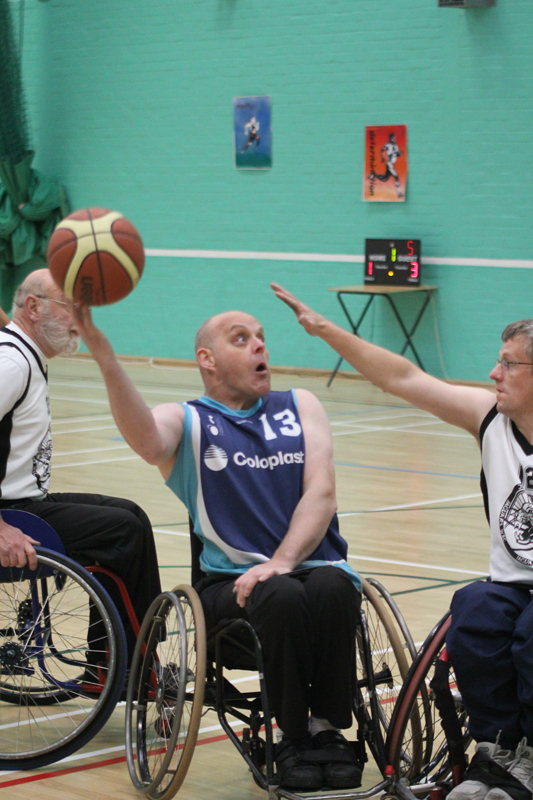 Having played basketball before, wheelchair basketball was of particular interest. After this I contacted the local club Hereward Heat who play at a village college in Comberton, between Royston and Cambridge. Hereward Heat provided a chair and a number of free sessions to see if I enjoyed it. It took a while to get used to it, and I am still learning, but eventually I was signed up to the team and have played in the British League all over the south of England. I have been playing for 4 years now. Wheelchair basketball is inclusive and covers all types of disabilities, from abled-bodied to spinal injuries, all ages, teens to 72-year-olds, and it is a mixed league, although there is also a separate Ladies League. How does it help with my MS? Fitness: I would recommend people start playing much earlier than I did as it can keep your fitness level up. I waited a bit too long and it took a while to get used to it. Initially I was wiped out for the next day or two after two hours training. I still have to be careful to not overdo it. However this week, a few years after I started, I have been able to go to the gym for an hour and train for two hours with my team and two hours with another local team (Eastern Blue Stars) and still go to work full time and do one hour physiotherapy. This is a significant change which I did not think was possible originally. The extra fitness seems to be very positive with the condition. Strength: Playing wheelchair basketball has helped with my upper body strength, which has been very useful for helping me day to day: helping me to get out of the bath, use crutches and generally move myself around. Co-ordination: Playing forces me to use my left arm a lot which is starting to be affected and would probably be used less if it were not for the sport. Independence: In the past when I would go to training (probably 4 years ago) my wife would come with me to help and make sure I was OK. Now, even though my mobility is worse than back then, I go by myself and load and unload chairs and drive home. I do not think this would have been possible without the sport and need to attend. Mental attitude: Many of the players have different conditions (some are able-bodied but with arthritis in the knees or similar). Some have cerebral palsy, amputations or spinal injuries. Their conditions are often more challenging than mine is at present which helps keep things in perspective and helps mentally with my journey. In many cases I think if they can manage I certainly should be able to. It is also very challenging to play and means you have to work out strategies and moves during the game. This is really helpful cognitively as well. Wheelchairs: Playing basketball has taken all concerns about using a chair away. I used two crutches for about a year and I struggled with doors, could not carry bags or walk very far. When we went shopping my wife would go into the shop whilst I waited outside. However, about a year ago I bought a chair to use daily and had a lot of help with the specification and the best features from the team. Being in the chair was like walking again which may sound strange, it required no thought, rather than loads of concentration to prevent a fall. I could go around shops again and go out all day without a problem, go into restaurants and have time to make it to a toilet without a problem (chairs are much faster than crutches). All in all it has made the transition to a chair into a positive experience rather than a negative one. During my time playing my condition still has progressed but the sport allows for changes and as a result my playing score changed (if people want to know more about that please ask!) and I am still able to keep playing. We are desperately short of players, so if anyone is interested in my area please do get in touch. I cannot recommend it enough. The coach is called Steve Spilka and you can contact him on Sspilkawba@aol.com. My email is jerry.burnie@i-q-s.co.uk if you'd like to know more.